POP’n link called upon a dedicated Pentalog nearshore team to create a functional minimum viable product (MVP) within a tight deadline. Learn about our IT profiles and contact us to get your project up and running in just a few weeks. Using the “link” technology, that won an Innovation Award in the “wearable technologies” category at the Consumer Electronics Show in Las Vegas in 2017, POP’n link has developed a technology patented around the world connecting ordinary objects to unlock new worlds and digital services: it’s called “POP” (Proof of Presence). 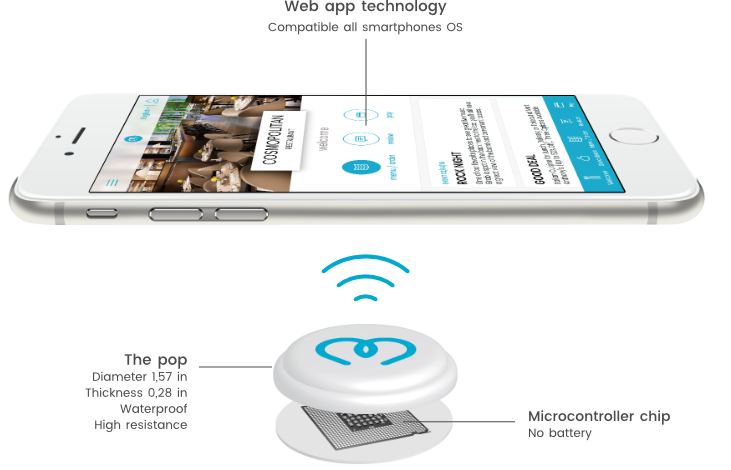 The POP technology connects with the user’s smartphone to enable instantaneous information sharing, irrespective of time or location. This is all done without collecting any user data or going through a mobile app. The POP’n link hardware can connect any ordinary inert object so that it can communicate with people. A true digital innovation, the POP’n link solution, using IBM’s Watson, comes in different forms of B2B solutions for cafés, hotels, restaurants, retail, entertainment, stadiums, conference centers, etc. It offers a new experience between the physical and digital worlds with the goal of generating greater engagement and new sources of revenue, with real time interactions (i.e surveys, chat, pre-ordering) and access to a personalized digital world! In practical terms, POP’n link is used to authenticate the physical presence of a user to enrich their physical world with the help of a contextualized web solution. This then enables digital retargeting. The creators of POP’n link had a clear idea of the solution they wanted to develop, but only had four weeks to launch a functional MVP, since they’d been selected by IBM to present their solution at the Watson Summit in October 2016 to offer a set of services to visitors of the event. Following a recommendation from another Pentalog client, POP’n link turned to a dedicated Pentalog nearshore team based in Chisinau, Moldova for the expertise, responsiveness, and support they needed for the project to succeed. The client promptly headed to meet the Pentalog team on-site. An initial analysis with help from a product owner helped frame the request and determine the functions that could be developed on such a tight deadline. Afterwards, the architecture for the solution was approved with the help of a Pentalog consultant. Development of the solution was then handled by two full-stack developers and two front-end developers, supported by a scrum master and a great deal of involvement from the client. The MVP was delivered on time and ready to go. The POP’n link solution was presented at the opening of the Watson Summit and generated activity on its platform throughout the entire event. The start-up made contact with many potential customers. The POP’n link team was more than satisfied with the results of this collaboration. As such, they decided to entrust Pentalog with the development of a platform of services using the POP’n link solution to extend its scope to new business sectors and new target audiences. The Pentalog team will work on a generic platform and new personalization modules while encouraging the business model to evolve.